Lately I have been thinking of grilled cheese sandwiches. The grilled cheese sandwich, just by itself, is pure comfort food. A couple slices of bread, some American cheese, and some butter is all you need to have thoughts of childhood, or to remove any stresses of the day. Two of my kids love the basic grilled cheese sandwich (God forbid that my oldest eat anything with melted cheese), and any time they are undecided what to eat for lunch on any given Saturday or Sunday, I also suggest a grilled cheese. There’s something about the low and slow process that I totally love. There is also something about coming up with new ideas when it comes to cheeses, and other ingredients that, well you know, I totally am all about. With that said, that’s when I decided to some up with a twist on a grilled cheese, and go all out, making what I am calling the Grecian lam and tzatziki grilled cheese. Make the tzatziki sauce by adding all of the ingredients into a mixing bowl, and stir to combine. Next, form your lamb into a ball. Season with the salt and pepper. Heat a large skillet on medium-high heat, then add the lamb. Let cook for about 3 minutes, then smash it down with a large spatula. Flatten it like you would a smash burger. Continue to cook for about 2 minutes to get it nice and caramelized. Flip the patty, and continue to cook an additional three minutes. Add the onion ring, and let the onion gently cook on top of the burger. Remove the lamb patty and place on some paper towel to let any excess fat be removed. Spread butter, along with 1/2 tbsp mayonnaise onto each slice of bread. Yes, mayonnaise. Place the bread, butter and mayonnaise side down, on low heat onto a skillet, then layer the blue cheese. Cook for about 5 minutes on low. When the bread becomes lightly golden, add the cooked lamb burger with the onion ring, making sure the center of the onion is removed. Continue to cook until the bread starts getting a bit darker golden brown. Add the tzatziki sauce into the center of the onion ring. Top with the Carr Valley cheese, then add the remaining slice of bread, butter and mayonnaise side up. Carefully flip, then weight down with a heavy pan, or bacon press. Continue cooking on low until the bottom side is golden brown, then flip again, press with the bacon weight, and cook until the cheese is nice and melted on both sides. 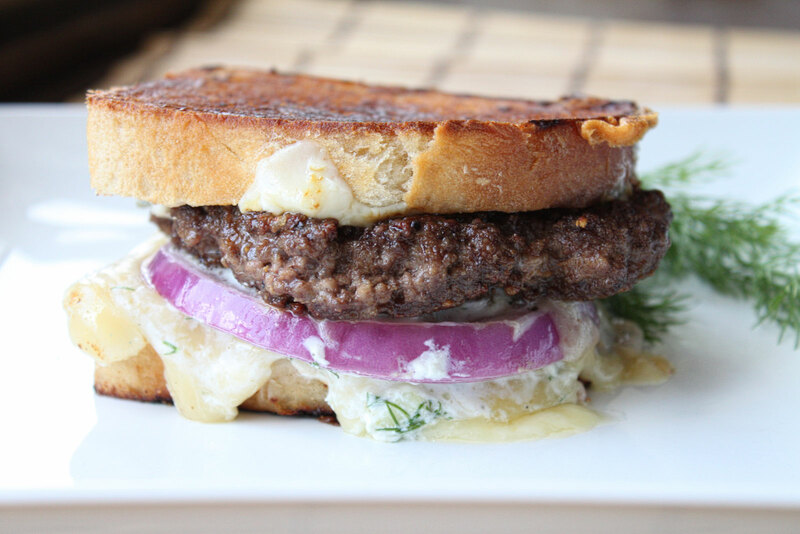 Now you want to talk about an awesome grilled cheese, then this is the one. Talk about surprises in this sandwich. You get that nice boldness with the lamb, and then the creaminess hits you from the Carr Valley cheese, then a punch from the creamy and melted blue cheese, only to be balanced with the wilted onion and tangy tzatziki sauce. It was extremely difficult to put this down, and to be honest, it only hit the plate one time before I continued to devour it. Hope you enjoy! This looks amazing, red onion is always a nice twist!